New variable High Pass Filters from 0 to 200Hz are added to the detector stage of each limiter channel to improve and customize limiter behavior. The HPF’s tell the limiter NOT to trigger limiting based on content below the set HPF frequency. This is extremely helpful on bass heavy material. This greatly widens the units potential application set and the ability of the user to set this new behavior “on the fly”. Variable linking between channels is envisioned for use when compressing two different tracks, such as bass and kick, to tie limiter action together to greater or lesser degrees. The Stereo Link is continuously variable from 0 to ?. All controls except “Ratio” are pots. The new variable pots add the ability to fine tune behaviors in the studio. Mastering engineers may prefer the repeatability of switches, such as those on the FET II, which will continue in the Daking product line. The FET II’s relied on control voltage summing for the stereo linking. Because the FET III is two independent units in one box, it uses audio summing, which is much more accurate. 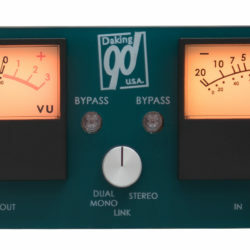 The Daking FET III uses THAT CORP differential amps in and out (electronically balanced). The FET II has transformers in and out but they are 1:1 input to output so they do not “color” the sound. (A mic input transformer at 1:10 ratio in a mic pre would color the sound significantly.) The common mode rejection in FET III is equal to that of FET II. The FET III output level is +24 while the FET II can be as high as +30. 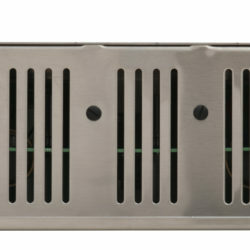 The FET III and FET II both use an outboard power supply. The unit is fully RoHs compliant. Click here to hear more audio files in high resolution!